Amazon was criticized earlier this year for a controversial patent application that detailed an “ultrasonic bracelet” that could be used to surveil workers. The company’s newly public application for augmented reality goggles made specifically for warehouse workers is far more alarming. The purpose of “Augmented Reality User Interface Facilitating Fulfillment” is, on its face, a means to navigate Amazon’s often sprawling warehouses, many of which are well over a million square feet. Goggles connected to a worn or carried computing device overlay turn-by-turn directions from one item to the next, according to the patent application. Where Amazon’s Flex app seems to be a play to collect on-road navigation data to eventually replace human drivers with autonomous vehicles, in-facility routing data could be a used to train the robots many warehouse workers already believe will eventually make them obsolete. We’ve reached out to Amazon for comment on the AR goggle patent application and will update if we hear back. Amazon currently tracks an astonishing amount of individual employee data and distills it into punishing “rate” goals for each worker to hit daily. That data is mostly culled via hand-held scanners that log usage and downtime. 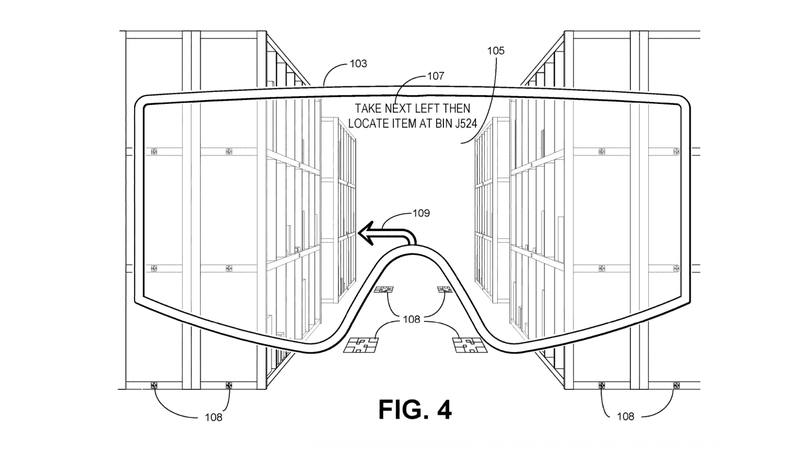 Via some combination of onboard tech and/or QR codes littered around the warehouse floor, Amazon’s imagined routing goggles would be made to go further, tracking “orientation data, pitch, yaw, [and] accelerometer data,” meaning walking speed, exact locations, and even where employees are looking would be up for grabs. Explicitly, the application states: “In some embodiments [...] the wearable computing device can be configured to provide worker instructions and/or visual indicators to a worker wearing the wearable computing device who is not moving.” Given the difficulty Amazon workers apparently face even stopping work for basic necessities, like the use of a restroom, it takes little imagination to see how this AR device could become an even more intrusive form of productivity harassment. As with any patent application, there’s no guarantee such a device will ever be built or distributed within warehouses, but it gives an indication of the company’s thinking. Holistically, Amazon seems intent to ramp up surveillance, both internally and as a vendor product for law enforcement.